Synopsis: Cool temperatures are expected over the next ten-days providing conditions for extended apple bloom of mid-late varieties in the Hudson Valley. Today we are seeing full bloom of McIntosh with Ginger Gold, Honey Crisp and Red Delicious at petal fall (Highland-HVRL). We will likely see a delay in plum curculio migration this season given the cool temps ahead. A benefit of postponing a petal fall spray would buy you time, and possibly a single application, for plum curculio management depending how log of a migration period we experience. 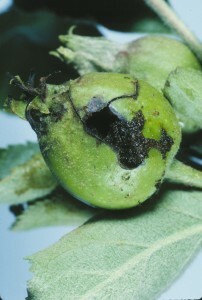 The risk however includes European apple sawfly (EAS) and lep larva injury to developing fruit during fruit development. Yet the EAS has been in relatively low numbers over the past few years with untreated trees showing only 1.8% injury in Ginger Gold and McIntosh cluster fruit evaluations in 2016 Efficacy Studies. If you had a pink application on within the past 10 days (high rate of a pyrethroid or Lorsban for SJS & OBLR management) you have some insurance going into the next week with active residual to have reduced EAS and early PC moving into the orchard, putting you in a better position to wait, relative to not having put on a pre-bloom application. To add to the dialog, we did have 0.8″ of rain (Highland-HVRL) to reduce insecticide residual, which should be taken into account for your location, having had more or less rainfall. You should be using the best materials at the appropriate rate for each specific insect of concern. The 2017 Cornell Pest Management Guidelines for Commercial Tree Fruit Production can assist in decision making during the growing season with on-line access available. Introduction: A few warm days beginning on the 26th of April gave rise to the first blossoms with 50% bloom occurring shortly thereafter on the 27th at the Hudson Valley Laboratory in Highland, NY. To date we are looking at petal fall prediction for the 11th of May for McIntosh at the the HVRL, near the average for the past 30 years (Historical McIntosh Phenology). As we move toward petal fall, pest management decision-making should take into account problems that occurred last season. 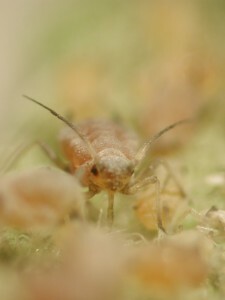 These include the endemic pests residing in the orchard, those that caused fruit injury resulting as culls at packout, as well as the insect complex that had been flying into the orchard over the past few weeks, specifically obliquebanded leafroller, and those that will be emerging from within, such as codling moth. A cooling trend for the remainder of the week will delay plum curculio emergence and codling moth trap captures. The Cougarblight fire blight model is showing extreme likelihood for infection and will require management today from yesterdays rain events. 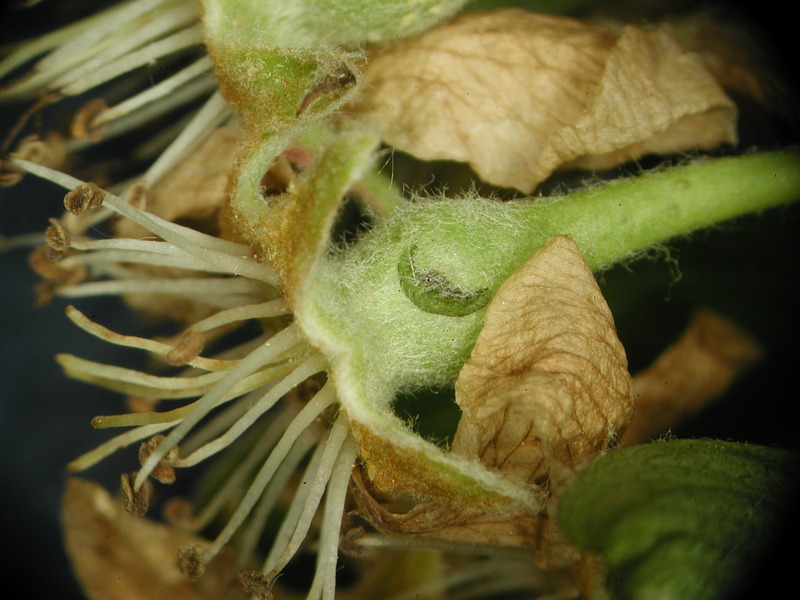 Apple scab management on the other hand has been challenged with continuous showers and high rain amounts over the past few weeks with 3.52″ of rain falling in April and 0.30″ falling from showers two days ago at the HVRL. Be advised that a freeze event and frost conditions in pockets and higher elevations are cause for concern, especially when using oil and or Captan over/under oil residue as foliage becomes more susceptible to phytotoxicity on either side of a freeze event. Our scouting observations have shown little in the way of larva feeding on flowers or foliage in the mid and northern Hudson Valley. However, to our north, blossoms and developing foliage have seen damage from overwinter and newly emerging Lep. larva. We have seen very few rosy apple aphids (RAA) in untreated and treated trees to date but they are there in low numbers until conditions become more favorable. Management: Calypso 4L is no longer available for use in tree fruit management. If you became accustomed to using Calypso or other neonicotinoids during the petal fall window, the translaminar or systemic activity of these insecticides have kept foliar feeding insects such as aphids and leafhopper well under control. If you are transitioning from a neonicotinoid to a contact contact insecticide, such as Imidan or the pyrethriods used alone, then consideration should be made for RAA management prior to leaf curl and fruit injury prior to full establishment of this pest in the orchard. The addition of the neonic’s, such as Admire Pro 4.6SC (imidacloprid) at 2.8 fl.oz./acre, Assail 30SG at 2.5-4 oz/acre, or the use of Exirel (cyantraniliprole) at 13.5-20.5 fl.oz./acre will provide the additional broad spectrum activity needed for RAA management, including green aphids and leafhopper. The active ingredient for Exirel is cyantraniliprole, the anthranilic diamide class (Group 28), in the same class as Altacor (Rynaxypyr) with a broad spectrum of activity. A post bloom application of Movento 240SC at 6-9 fl.oz./acre is also very effective against RAA and would reduce the San Jose scale residing in the trees. 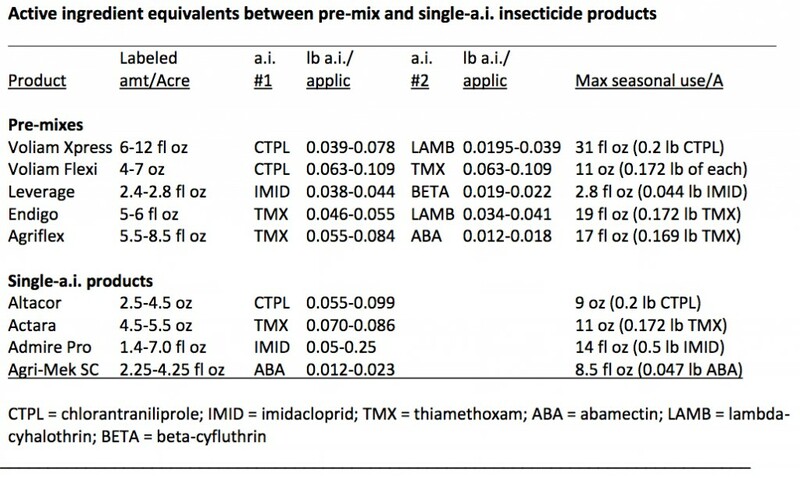 The use of pre-mix insecticides should be strongly considered here. In the article “All in the Mix”, Dr. Art Agnello points out that ‘the amount of chlorantraniliprole a.i. in a high-rate application of Voliam Xpress (0.078 lb) is lower than a comparable application of Altacor (0.099 lb); also, you can see the difference in thiamethoxam a.i. between the use rates of Endigo (0.046-0.055 lb) and Actara (0.070-0.086lb). Additionally, note that thiamethoxam is limited to a maximum seasonal total of 0.172 lb/A, regardless of the formulation, which can complicate mixing & matching of products during the season.’ It’s very important to know that if a full rate of thiamethoxam is essential for plum curculio management in high pressure blocks, then a pre-mix may not be the best option. RAA colony exposed within a curled leaf. The insect to which we can attribute the highest losses in apple during the petal fall period is the Plum Curculio (PC), a native of North America and major pest of pome and stone fruits in the United States. As most commercial orchards are free of endemic PC populations, the migrating adult will be moving in from hedgerows and woodlands to damage fruit. This is not so for organic orchards that do harbor endemic populations of emerging adults from within orchards. 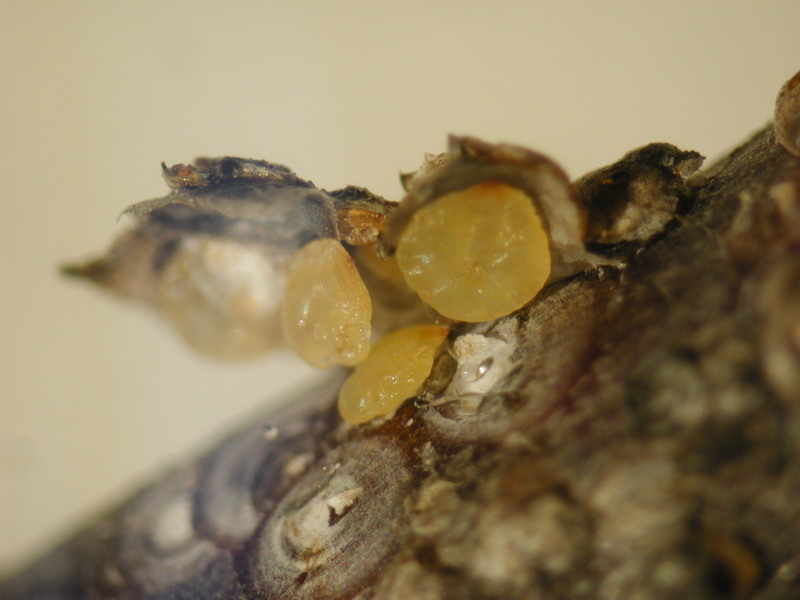 The approved organic pest management tools used against the PC tend to be repellent with only moderately efficacy at reducing oviposition to fruit. PC overwinter as adults in ground litter or the soil and become active in the spring following several days of either a mean temperature above 60°F or maximum temperatures above 75°F. This weather pattern is forecasted for this week as we near petal fall. However, if we see a temperature drop and conditions become unfavorable, the adults may return to hibernation sites. The emergence period for PC can last for several weeks, however, we can see 40-60% of the total emergence occurring on a single day with very high egg laying damage levels over a 24 hour period. With the loss of Calypso, Guthion and the use of post bloom Lorsban, we are finding fewer broad spectrum insecticides to manage the pest complex at petal fall. The OP Imidan 70WS as mentioned earlier, used at the higher rate, is comparable to Guthion, yet without the added efficacy against the RAA or aphid & leafhopper complex of Calypso. The use of Actara 25WDG at 4.5-5.5 oz./A will provide activity against PC, the leafhopper and aphid complex. Its very important to note that Actara (Thiamethoxam) is not effective against the lep. complex. It also has been observed by growers to have bee repellency if applied near bloom. In LD50 efficacy studies thiamethoxam applied directly to pollinators was found to have high toxicity. Avuant 30WDG at the high rate of the 5-6 oz./A range will manage PC with varying degrees of activity against the secondary pest spectrum. If you are relying on the repellency of the barrier film Surround (Kaolin Clay) instead of PC mortality through the use of conventional insecticides, coverage will need to be maintained until curculio egg laying is completed, predicted to be the last week in June. Control of the larva and pupal form of PC is presently being invastigated using entomophagous nematode introductions. Information available in PowerPoint of the on-going nematode research in NY State. European Apple Sawfly (EAS): are primitive hymenopterous insects, related to bees, wasps, and ants having a single generation per year in NY. An introduced pest that was first noted in North America infesting Long Island crabapples in 1939. 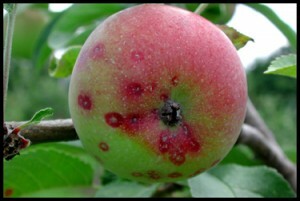 The pest is especially troublesome in the apple-growing regions of the Hudson Valley of New York with increasing levels of infestation occurring in more northerly regions of the state. 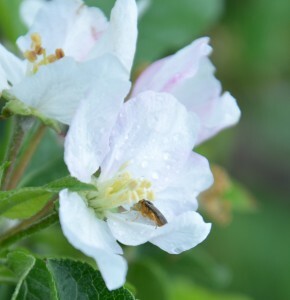 The larvae feed on apple with a preference for early or long-blooming, heavy-set varieties. Years in which there is a very late bloom typically have very few EAS present to cause damage to early and mid-pollinating varieties with small amounts of damage noted to late harvested fruit. Timely controls for PC at PF will eliminate the need for EAS management in conventionally grown fruit. Surround WP used for organic PC management will only have marginal control of EAS. 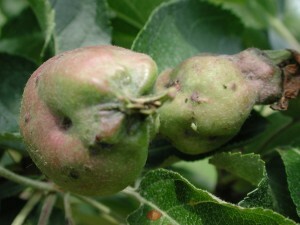 Late applications or a delay in PC management during cool years of prolonged bloom, will allow EAS larva to hatch and begin feeding, giving rise to apple injury. Our scouting report has shown potentially high numbers of Red Banded Leafroller (RBLR), Oriental Fruit Moth and increasing Lesser Apple Worm (LAW) adult populations that often give rise to larva that feed on flowers and developing fruit. As RBLR has been flying since the 10th of March, we have seen peak trap catch and the approximate start of egg hatch occurred on Monday, March 28th and will continue on through bloom. Although larva have yet to be observed in untreated trees in Highland, scouting should include sampling and observations for RBLR in flowering clusters. Since we haven’t seen the larva of green fruit worm (GFW) or Obliquebanded Leafroller (OBLR) during bloom in untreated trees, its likely high overwintering mortality and cool spring suppression of these insects have reduced the presence of populations to reduce the need for management of these pests? The warming trend this week should prove this either way. If they do become an issue at bloom, foliar and blossom feeding ‘worm’ can be held in check using Bt formulations. The Bt products such as Biobit, Dipel, Javelin, and MVP (IRAC 11 B2) also have a low impact on beneficial mite and are very effective against overwintering obliquebanded leafroller (OBLR) and the green fruit worm (GFW) complex. The Bt products can be used through bloom as needed and their use should be optimized employing multiple applications at 5-7 day intervals at the low-labeled rate. •	Intrepid (methoxyfen-ozide) (IRAC 18A) another reduced risk insecticide very effective against the larva, acts as an insect growth regulator to imitate the natural insect molting hormone and works by initiating the molting process. Activity of the insecticide is primarily through larval ingestion of foliage, excellent coverage is necessary for effective control. Intrepid is quite safe to birds, fish, and most beneficial insects and can be applied from pink through petal fall. It is registered on pome and stone fruits for control of oriental fruit moth, lesser apple worm, spotted tentiform leafminer and leafroller, with suppression of codling moth at the highest labeled rate. REI = 4-hours; PHI = 14 days (pome fruits), 7 days (nectarine, peach and plum). •	Proclaim (Emamectin Benzoate) is registered on pome fruit for the control of leafroller, spotted tentiform leafminer and suppression of codling moth, oriental fruit moth, lesser apple worm and spider mite in apple and pear psylla in pear. It interferes with neurotransmission in insects resulting in the loss of cell function and nerve impulse. Proclaim, when used with a penetrant, has translaminar activity through ingestion and limited contact activity. Proclaim 5SG rate is 3.2 to 4.8 oz. per acre and seasonal maximum of 14.4 oz per acre. 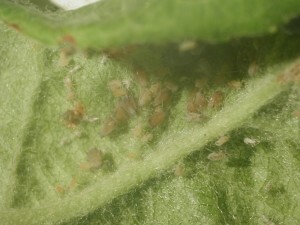 Begin application at the onset of hatch to control early stage larvae. Apply using a minimum of 40 gal. of water per acre with a horticultural spray oil or a nonionic penetrating surfactant. Do not use a sticker or any other pesticide or product containing a sticker component in its formulation as stickers can drastically reduce pest control. REI = 48-hours; PHI = 14-days. Oriental Fruit Moth (OFM): Flight began on April 25 with 1st generation egg hatch and treatment for >50% hatch beginning May 24th. To date we have not captured Codling Moth (CM) adult males. ‘In the old days’ the broad spectrum OP insecticides targeting plum curculio would prevent codling moth damage. However, with the loss of Calypso, loss of Lorsban use at PF, and loss of Guthion and other contact insecticides efficacious against CM, we are left with fewer broad spectrum insecticides that manage both PC and CM. Since larva emergence typically occurs during the 2nd cover window we don’t need to address this insect yet, however, If you use Actara for PC control at 1st or 2nd cover, the lep complex can slip through the program. Using only Actara at 2nd cover will leave you open for lesser apple worm and codling moth injury. 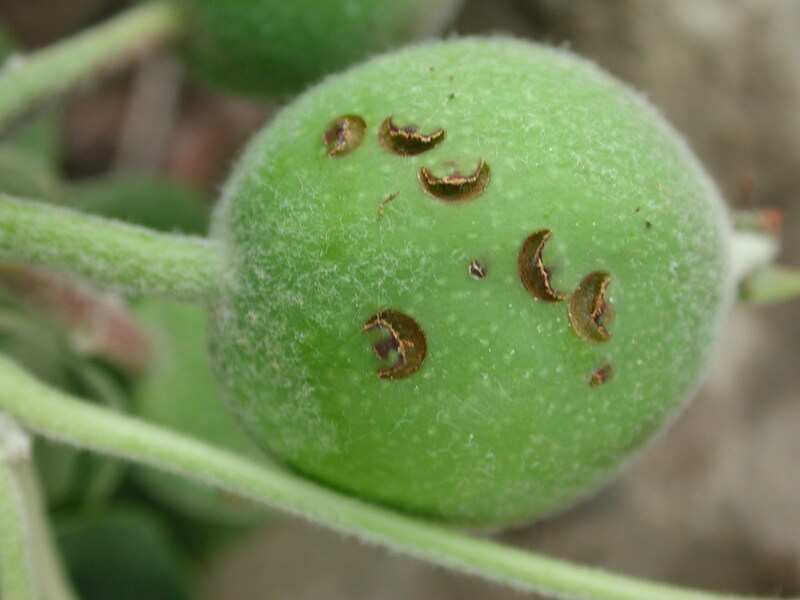 The Tarnished Plant Bug (TPB): is a predominately a pre-bloom pest of apple, a true bug in the order Hemiptera, with piercing-sucking mouthparts such as is found in aphids and leafhoppers. The adult TPB has a color appearance ranging from dull brown to black. The rear half of the forewings are membranous and are bent downward with a distinct yellow triangle behind the head. The adult bugs hibernate under leaf liter, clover, alfalfa, mullein and protected places of stonewalls and tree bark. Orchards with weed host density are more prone to damage. Control of weed hosts, such as common mustard weed, has been shown to reduce fruit injury. They become active at relatively low temperatures (> 46oF) with feeding becoming pronounced at temperature at or above 70oF, between tight cluster through the post bloom period of apple. The pyrethroids (Asana, Ambush, Baythroid, Danitol, Pounce, Warrior ) are most effective, followed by the neonicotinoid group including Actara, Assail and Avaunt, which are moderately effective. If Pyrethroids and neonicotinoids were used at pink they would have had some impact on the insect pests damaging to fruit such as RAA, STLM and early immigrating PC. However, given the prolonged bloom this season (17 days and over 2.5 inches of rain in most Hudson Valley sites), its likely there is little in the way of residual activity left. Mullin plant bug feeding to red delicious fruitlet. 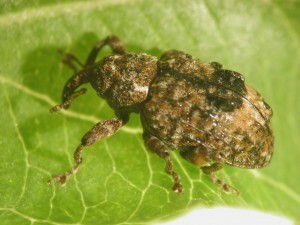 Mullein Plant Bug (MPB): and apple brown bug (ABB) are occasional pests that move into trees during the pre-bloom period, feeding on fruit shortly after fruit set. In blocks where historical injury has been observed, scouting for this insect in Red Delicious, Golden Delicious, Northern Spy, and Spartan with McIntosh seldom suffering damage. The expected 50% egg hatch date is Monday, May 9th, about 4 days before Red Delicious petal fall date. 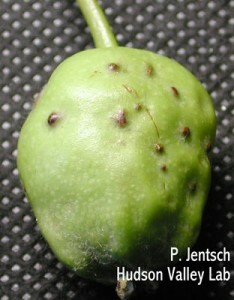 Most literature states that MPB and ABB are pests only during the period from bloom through about the time fruit are 0.5 inches in diameter. After that, they are beneficial, preying on European red mite, aphids, psylla, and other insects. Petal fall insecticide applications will kill most of the nymphs present, with some of the damage occurring by then. However, if timely petal fall applications are omitted the MPB will continue feeding on developing fruitlets well after petal fall. Red Delicious are especially prone to MPB feeding injury. Petal fall sprays should be applied as soon as possible after blossoms are off. Assail, Actara, and pyrethroids are quite effective against the insect. San Jose Scale (SJS): If pre-bloom applications of 1-3% oil, Lorsban alone or with oil, Esteem or Centaur were applied effectively to blocks with know SJS populations then you can relax until nymph emergence during 3rd cover, sometime in mid June this season and too early for modeling. Scouting for nymphs in mid-June will determine if your pre-bloom applications were effective. However, you will need to consider the use of Movento 240SC at 6-9 oz./A plus a non-ionic penetrant, such as 0.25% to 1% agricultural oil, to address the San Jose Scale fruit injury at pack out last year if pre-bloom applications were omitted this season. The active ingredient in Movento, spirotetramat, is taken into the foliage, systemically moving through plant tissue to stems, roots, and leaves to be fed upon by emerging SJS nymphs during emergence and feeding. Our research has found the single application of 9 oz./A at PF or two applications at 6 oz./A at PF and 2C to effectively control the 1st generation of the insect.